Tucked away in a corner on the second floor of Belk Library, the Archives & Special Collections is home to many treasures. But for any literature buff, one of the most interesting pieces of the collection may be the first edition of one of the greatest American novels. The first-edition of Walden, written by Henry David Thoreau, is part of the Williams-Honeycutt Rare Book Collection at Belk Library. This collection is made up of first-edition books that date mostly from the 19th century. Elon University Professor of Marketing, Earl Honeycutt, and his wife Laura made the donation in December 2006. 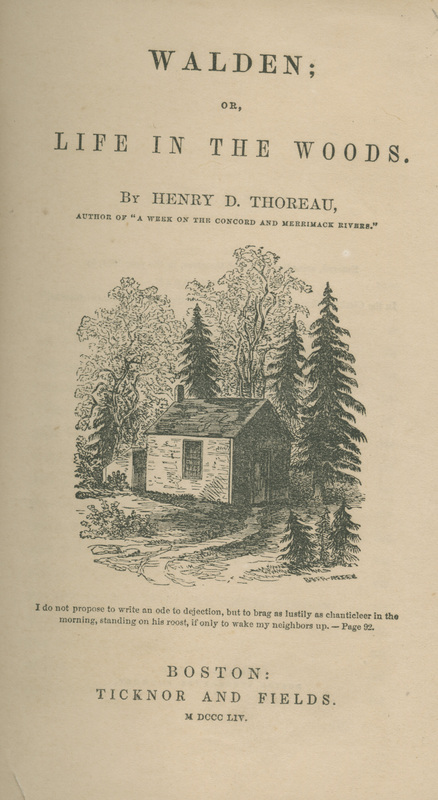 Thoreau’s novel, Walden, is one of the most unique publications in the collection. The first page of Belk Library's edition of Walden. Photo courtesy of Belk Library Archives. While some people may think that any old book is rare, they are mistaken. “Age by itself is not enough to make a book valuable. The importance of the text, the condition of the book, and the demand for it will determine the valuation of an old book,” states the Association of College & Research Libraries. Specifically with Walden, there are several characteristics that set the first-edition apart from later editions of the novel. For example the binding for the first-edition is a brown cloth and there is a map of Walden after page 306. If the map is missing, the value of the book will be greatly diminished. Anyone interested in viewing the first-edition copy of Walden in the Belk Library Archives & Special Collections will need to contact the Archivist directly at knash@elon.edu or visit the Archives Web site for more information: http://www.elon.edu/e-web/library/libraryinfo/archiveinfo.xhtml. ← Belk Library turns 10!